Hello! 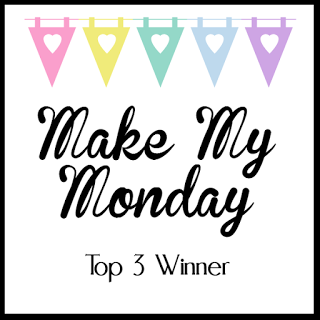 Today I am sharing my second design team project for January for Auzz Trinklets and Crafts with the theme All About the Girls. 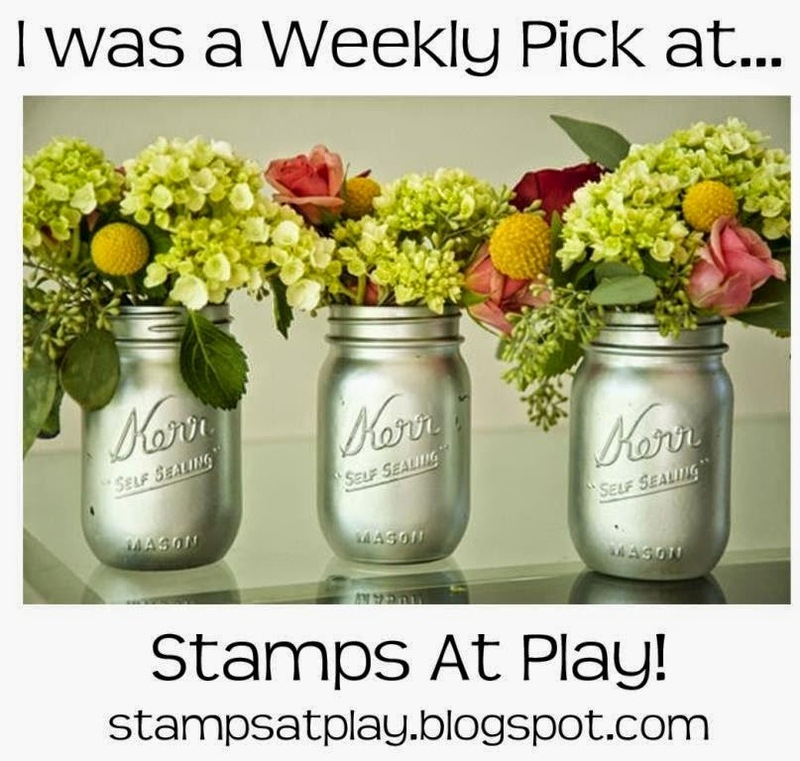 When I ordered the Honey Bee stamp set Little Pickup from Neha, I knew I had to create with it right away! It kind of screams to be used on a card for a bloke, but the set itself is so versatile with all the sweet additions you can have loaded into the back of the ute. I figured that pink and frills are not for all girls…but (I think) most of us like to receive flowers! There are words from the Honey Bee Sending You Sentiments stamp set that coordinate with this set which can be used for a celebration, a get well, a heads up on a change of address and on an occasion when you want to lift someone’s spirits. This card uses Neenah Classic Crest 110lb Smooth Solar White Paper for the base which is cut at 4 ¼“ x 11” and scored at 5 ½“ to make a side folding card of 5 ½“ x 4 ¼”. I applied Tumbled Glass and Broken China Ranger Distress Inks directly to the top half of the card base with a Ranger Mini Ink Blending Tool to create a sky back ground. I coloured the area in Peeled Paint Ranger Distress Ink that would be seen behind the track. The hills with tree trunks were die cut with the Lawn Fawn Lawn Cuts Stitched Tree Borders and I also used the coordinating Lawn Fawn Lawn Cuts Grassy Hillside Borders for the foreground of the scene. These pieces were coloured with Shabby Shutters and Peeled Paint Ranger Distress Ink as were the green leaf pieces for the trees. I coloured the tree trunks with a Ranger Distress marker in Gathered Twigs. On each piece – the sky, hill and two layers of grass, I squirted water using my Ranger Distress Sprayer which left the splotchy texture. I took the first layering piece with the trees and die cut a track into it for the ute (pickup truck) to move along. The Lawn Fawn Lawn Cuts Slide On Over set also coordinates, however I wanted the track to be a little longer than the die would allow. 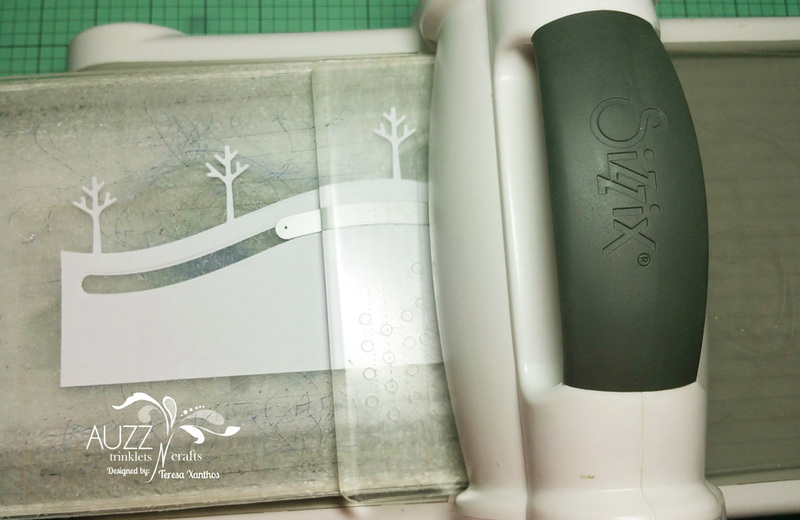 I placed the piece into the Sizzix Bigshot so that the right side of the die was hanging outside the sandwich of the plates so that it would not be cut. Please excuse the state of the plates! I then flipped the die around and matched it up with the cut piece and again ensured that the die would not cut at that end by leaving it outside the plates. This enabled me to have a longer track along the card. Again, please excuse the state of the plates!! 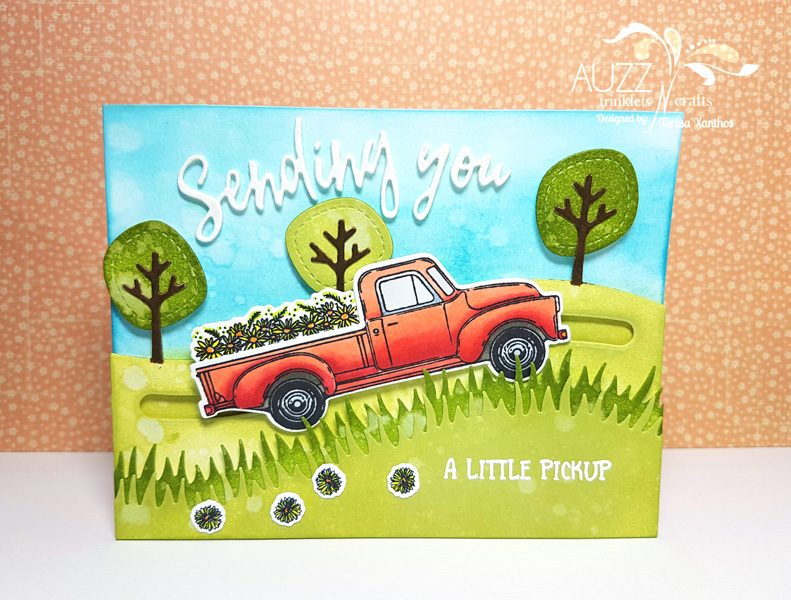 I stamped the ute and flowers from Honey Bee Stamps Little Pickup with my MISTI stamping tool in Memento Tuxedo black ink onto X-Press It Blending Card and coloured the ute and flowers with Copic markers. 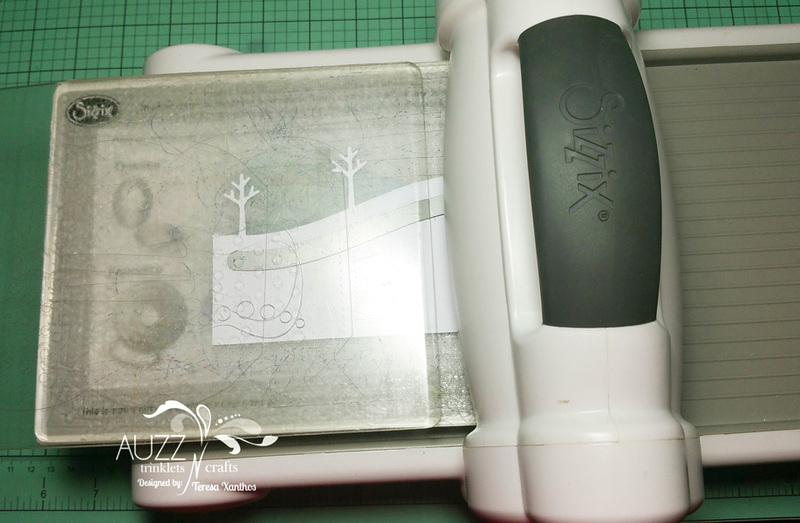 The flowers and ute were then diecut using the coordinating Honey Bee Little Pickup dies. 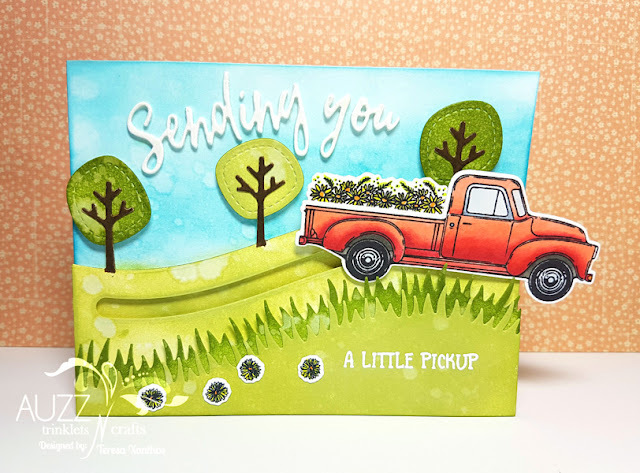 I chose 'a little pickup' sentiment from Honey Bee Stamps Sending You Sentiments and stamped in Versamark ink using the MISTI stamping tool to assist with placement and embossed with Hero Arts white embossing powder using the Wagner heat tool. As the ute is a large image, I cut four cardstock discs with the My Favorite Things Surf and Turf dies so that I could secure it in two places. I glued a My Favorite Things Spin & Slide Disc onto two of the cardstock discs with Ranger Multi Medium matte and placed them into the tracks underneath so the Spin & Slide discswere facing up. The other cardstock discs were then adhered onto the other side of the Spin & Slide discs. At this point, both ran freely along the track. I placed them apart so the ute could then be glued to the discs in a sturdy position. I then adhered this layer to the card base using 3M Scotch Double-Sided Foam Tape and used it also to adhere the first layer of grass in order to give the ute clearance to move along the track. I adhered the final piece directly using Ranger Multi Medium matte and added the single flowers along the bottom of the card. I finished off the card by diecutting three of the 'Sending you' sentiment from Honey Bee Stamps Sending You Sentiments die set from white cardstock and layered them together, adhering the words to the card base using Ranger Multi Medium matte. With a lick of Zig A Wink of Stella in clear over the sentiment, the card was complete. Thankyou for following along with me today; please feel free to ask questions if anything needs clarifying. 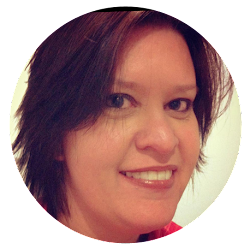 If you cannot find the items I have used (listed below) in the Auzz Trinklets and Crafts store, be sure to drop Neha a message via email or Facebook and she will do what she can to order the product in for you. What an Awesome Card. I am yet to tackle a slider Card maybe retreat! Bring your knowlege!